Hello hello, gentle reader. Though it’s been quite some time since my last post, the gap between this and that is dwarfed by the previous period of silence. How do I do it, I hear you ask. How can I possibly find the time to update a blog more than once in a single calendar year? The answer, my friend, is time management. 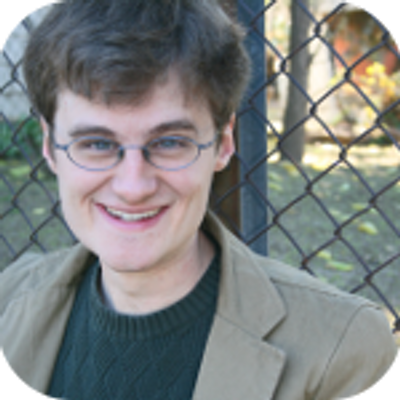 As you likely already know if you’ve managed to find my humble corner of the world wide web, I’m a graduate student studying computer science at the University of California Santa Cruz in the Expressive Intelligence Studio. As you may not know, the life of a graduate student frequently lacks clearly defined schedules. My first two years in the program had some of the trappings of school I was familiar with: classes, tests, electives, and homework. But all the while, I was also expected to work on this amorphous concept referred to as research. I certainly didn’t know what constituted research when I first joined grad school, and truth be told I’m still not entirely clear on what counts and what doesn’t. What I did manage to pick up on is that as the years progressed, I had fewer and fewer classes to take, and more and more of this mysterious research to do. Research did not have regular set meeting times. Research did not have regular deadlines or due dates. To be sure, it had those things sometimes, but more often than not I was on my own. My advisers would diligently meet with me every week to hear what I had managed to accomplish, and I would diligently share with them the piddling amount of work I had managed to motivate myself to get done, and they would seem to accept it and the process would continue. This scenario happened every week for well over a year. Now, I get the impression that many grad students feel like they aren’t achieving enough on a day to day basis. That I was in good company feeling like a charlatan, and that I should trust my advisers to inform me if they were displeased with my progress. All of this is probably good and true. It didn’t change the fact that I hated the way that I felt every week. I felt like I was letting my advisers down, sure, but it also felt like I was letting myself down. Moreover, it made me nervous that I *needed* externally imposed structure in order to be productive; which is in direct opposition to my idealized self who is an enthusiastic go-getter, capable of conceiving and executing myriad theatre and computer science projects alike. So I decided to take matters into my own hands. I decided to impose a structure for myself. Scrum was a technique that we employed when we were developing Prom Week. Although you can read all about it all over the internet, the brief version is that it’s a technique to promote agile development, frequently of software, in which teams of individuals are working together to achieve a common task. It’s designed to enable good communication, facilitate efficient use of time, allow lots of ‘check-in’ moments to make sure that what you are working on is what you really want to achieve, and to foster the ability to break large tasks down into smaller, digestible, actionable to-do items. 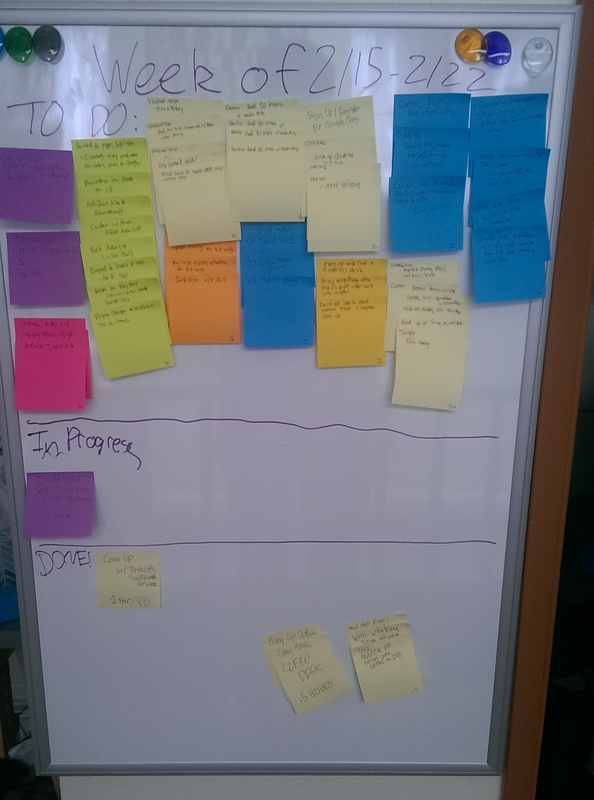 Frequently these big tasks are things like “Release this awesome new mobile app” or “finally get the augmented reality module to work” but I figured I would attempt to use Scrum for a slightly different purpose. 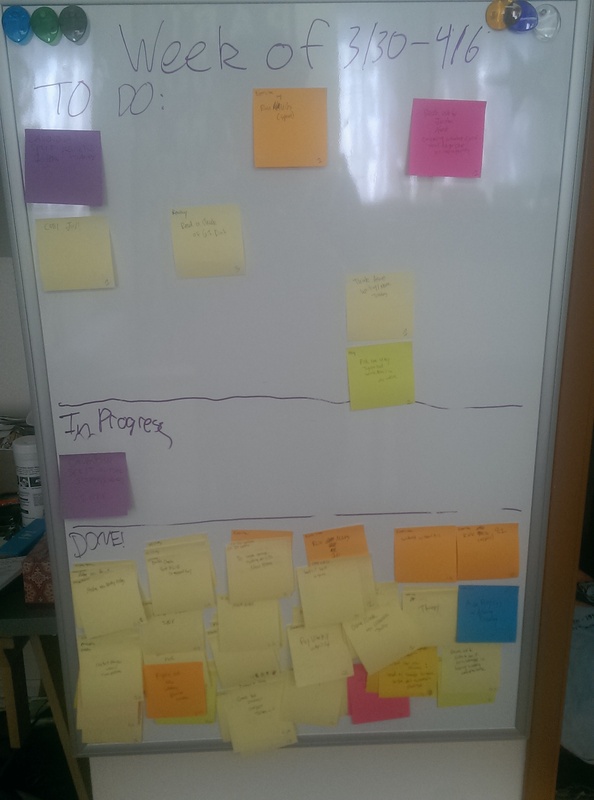 I wanted to use Scrum to get my life back on track. I think it has really helped me, and it might help you too. Sound intriguing? Well if so, read on! I’ll share with you my process towards becoming a better manager of the most convoluted project of all: my life. You then think of everything that you need to do in your life, write them down on sticky notes, and put every sticky note in the “todo” area of the whiteboard. As you start to work on a task, you physically move the sticky note from the ‘todo’ section to the ‘in progress’ section, and then once you’ve completed it, you can move the note to the ‘done’ section. Tada! That’s it! You’re scrumming already! 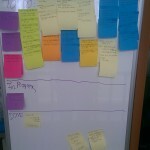 A typical scrum board at the beginning of a ‘Sprint’ — so much to do! Okay, I said that there wasn’t going to be any more theory, but what I meant was that there wasn’t going to be any more real theory. I’ll still gladly share with you why I think this process, as simple as it is, is so effective. Scrum: What’s So Good About It? It Gets You To Break Down Your Tasks: The mere act of writing down something that you need to do on a sticky note means that you’ve been thinking about some relatively small, achievable task that you can do in the service of achieving something large. That means that what you write down on a sticky note isn’t “finish awesome mobile app” or “write dissertation.” It means that what you are writing down is “fix UI bug x that appears on tablets” or “write first draft of section 2.3.1.” Some tasks might not lend themselves easily to being broken down like this, but I urge you, I implore you, I beg you, try to find a way to do it. For me, nine times out of ten I get scared and procrastinate from working because I don’t know what to do. But if you can put in the time to make a note–which again may require more than a trivial amount of brain power–then a lot of that particular source of fear will be gone. Some sample sticky notes. You can see Orange is my ‘exercise’ color. I should really be doing more orange tasks. It Gets You to Commit to and Focus on Your Tasks: The act of declaring that something is “in progress” should mean “I am actively working on this right now.” Frequently, we’re so bogged down with the weight of daily life that it feels like we are constantly in the middle of everything every second of every day. And, I mean, to some extent we are! We’re all busy people! But if you want to get something done, it helps tremendously if you can focus on that specific thing. 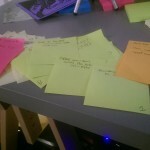 For me, moving that sticky note is a nice gesture which gets my mind into an appropriately focused disposition. It Helps You See At a Glance Everything You Need to Do: I mentioned a moment ago that we can easily become overwhelmed by how much we feel we need to accomplish. Laying everything out on a board won’t diminish the weight of your responsibilities in and of itself, but it can be a marvelous way to, in the words of my esteemed adviser, start riding the dragon, instead of being eaten by it. In other words, by concertizing and visualizing your tasks, you can be in control of them and your life, instead of the other way around. It Makes You Feel Like You Have Achieved Something: It feels frickin’ great to achieve things. From crossing things off lists to hearing the satisfying bloop-bloop of an unlocked Playstation trophy, knowing that you finished something feels mighty fine. There’s probably research that can explain what precise chemical our body releases when we complete a task that illuminates the sensation. I don’t know anything about any of that. I just know that I love the sensation of achievement, and boy oh boy, does Scrum provide that to you in spades. It does so on the ‘micro’ level, as you’ll get a burst of this thrill every time you move a sticky a note to the ‘done’ section, but what’s even more satisfying is on the macro level: at the beginning of the week, everything is still to be done, but by the end, you’ll be reminded of all that you’ve accomplished every time you look at the board. 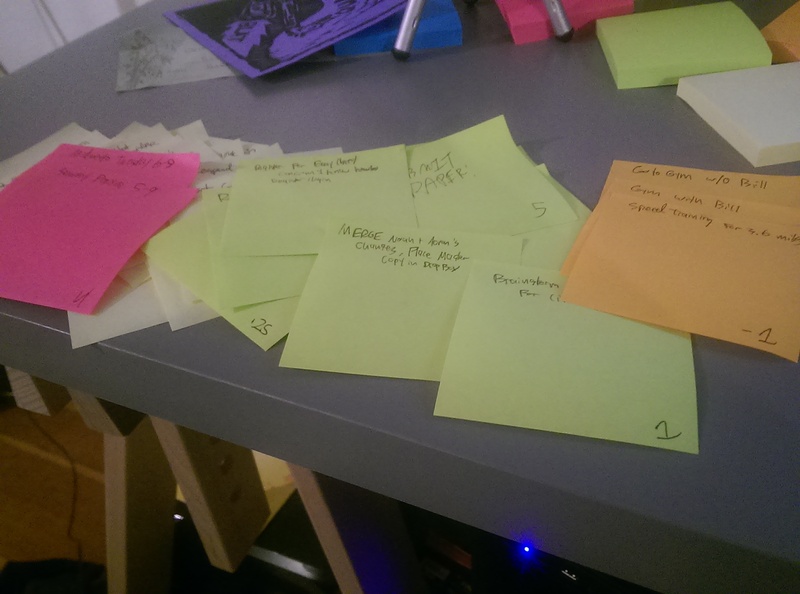 At the end of the day, it’s a great positive feedback loop: you move the sticky note to done, you feel great, and to chase that feeling you grab a new task and set it to “in progress” which gears your brain to focus on this new thing until it too is done, and the process begins anew. Now that you’re surely hooked, I’d like to clarify some of the finer points of the process, starting with addressing a blatant lie I told in an attempt to hook you. You don’t write down everything in your life. Because as great as Scrum is, it likely can’t account for all of your life’s goals. At least not all at the same time. Instead, you should focus on smaller chunks of time known as Sprints. 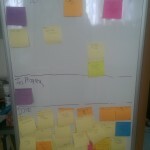 Each sprint should focus on a specific goal or small set of goals (e.g., I want to finish Chapter 2 of my dissertation), and then each individual sticky-note should be a relatively small, actionable task that can help accomplish those goals (e.g., write outline, write first section, revise first section, write second section, revise second section, organize references, etc.). I’ve found that Sprints that are around 1-2 weeks long work really well for me, but you should feel free to experiment to find a length of time that works best for you. You should take the time to reflect after each sprint. Even spending twenty minutes at the end of the sprint to check in with yourself can work wonders for future productivity. If you achieved everything you set out to do, you may want to consider challenging yourself to accomplish even more next week. If, on the other hand, you didn’t achieve everything you hoped to, it’s valuable to figure out what’s going on. Maybe the tasks were harder than you initially imagined? Maybe you realized mid-week that you didn’t really need to get them done and you focused on other things? Maybe lots of new stuff cropped up in the middle of the sprint that demanded immediate attention? Maybe (and this is a big one for me) you scheduled so much that you internally decided at the beginning of the sprint “well, there’s no way I’m ever gonna get all this done, so might as well not even bother, right?” Regardless of the reason(s), don’t beat yourself up over it. After all, this whole system is just meant to be a means to help you out, and if it instead it turns into a source of guilt, then it isn’t doing its job. However, if it can help you recognize patterns in your life that prevent you from achieving that which you hope to, then it *is* doing its job. Then the hard part is actually changing those patterns! In addition to the name of the task, it is useful to write down a time estimate and a priority level. I was resistant to both of these at first, but now I swear by them. The priority level–which can be as simple and arbitrary as 10 is ‘ultra high’ and 1 is ‘ultra low’–can help you figure out what needs to be done first. In general, choosing a new task is as simple as selecting the highest prioritized to-do item, but if you find that for whatever reason you’re not feeling focused enough for a high priority task, you can evaluate what you feel capable of doing and choose a task of the import level you feel comfortable with. The time estimate is extremely important, and I’ll talk more about it in part 2. But here’s the important part: it should ideally be updated for each task throughout the week, and the update should always be an estimate of how much time completing the task will require. This means that, if at the beginning of the sprint you think that solving some bug will take you three hours, and then you spend two and a half hours working on it with little progress, you would not update the time estimate to just be a single half hour left. You would honestly say to yourself “well gosh, this bug was harder than I thought it would be. I’d say I still have a good two hours left to go before I crack it” and then you update the task to say “two hours” remaining. This change in mindset was probably the single greatest tool to help me go from spinning my wheels to actually getting things done. Before, I would “put in the hours” regardless of results, and at the end of the day “feel like it should have been done given how much time I had invested in it” and then stop working on it. Writing it out like this of course sounds silly, but my brain was (and is!) very adept at finding justifications to make this behavior feel perfectly rational, and I wouldn’t be surprised if yours is, too. I think part of it comes from shame. The sense that something should only take such and such amount of time, and if it takes more than that then I must be doing it wrong or am dumb or am otherwise an inferior, bad person. But that’s not true at all! Stuff is hard! Stuff takes time! Sometimes stuff takes longer than you think it will! But if you’ll working on you’re stuff with focus and attention, then you don’t need to feel too bad if it takes longer than you thought it would. So, yeah, with this system, sometimes you predict something will take two hours and it ends up taking eight, which eats away at the rest of the time you have left to work on things. But sometimes things go way faster than you predict they will, and you essentially earn hours back! And that’s a great feeling. Ah! The sweet smell of achievement. I definitely think this is enough for anyone interested in Scrum to get started. Though intended for teams of people, I’ve found it has been incredibly effective applying it to my individual life as well. However, thus far we’ve only talked about the whiteboard, which is only half of the Scrum equation. Next time I’ll talk about the Burndown Chart, and how over the course of many sprints I’ve evolved a system that happens to work very well for me. Until then, gentle reader, be well!